When scaling down tank volumes and moving into the 'LNG as a fuel' business, a whole spectrum of operational constraints and principles for design optimisation have to be revisited. 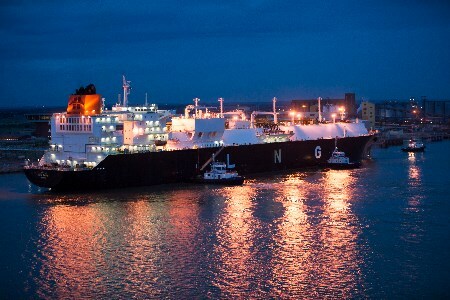 LNG is no longer a cargo, but rather a fuel that is mostly loaded while commercial activities are taking place. Handling solutions must, therefore, be simple and proven, leaving little room for extensive innovation unless shown to be efficient and economical. However, it is crucial to investigate how to efficiently utilise, transform or restore stored or evaporated LNG. Higher operating pressures for membrane barges and LNG-fuelled ships allow for more holding time and flexibility during bunkering operations, while also making it possible to accommodate a wider temperature range when the LNG is loaded from its source. GTT has obtained approval in principle from the major classification societies for the design of a 4000 m3 LNG bunker vessel with higher pressure rated membrane tanks, and cooperation is ongoing with the class societies to facilitate the first application of this concept. Boil-off rate for LNG as fuel applications can also be improved using the latest versions of GTT's Mark III technology. LNG transfer system: the GTT REACH4® system has been selected due to its weight and flexibility advantages. Piping on deck: understanding safety standards, modularisation and standardization principles, cost, weight and maintenance challenges has led GTT to work with shipyards and key partners to propose optimal piping configurations. Key equipment, such as pumps, compressors, dual fuel boilers, etc., have been selected with sufficient levels of redundancy, flexibility and availability. It should be emphasised that various technologies are proving to be relevant, such as volumetric type compressors or shell and plate type vaporisers. Key partnerships have been formed between GTT and other LNG companies. Firstly, its partnership with Ariane Group was formed to develop an understanding of the behaviour of LNG at a smaller-scale. During LNG transfer operations, similar phenomena happen as at large-scale. For example, heat inflows due to piping, transfer lines, pumps, flashing of LNG and the difference of thermodynamic state, etc. However, the power balance between those is altered in small-scale operations. Through an R&D programme, it has been possible to visualise, qualify and quantify LNG status in the receiver tank with regards to parameters such as the temperature of the fluid in feeder, the pressure in the receiver, top or bottom filling. The results are used in order to refine operational procedures and equipment design characteristics. Calibration being a continuous process, other sets of tests will be defined. The company has also formed a partnership with Wärstilä with the purpose of proposing a one-stop-shop fuel gas solution incorporating tanks and gas system, providing significant benefits to shipyards and shipowners with regards to lead time, cost, interfacing, etc. Other programmes have also been completed, such as a collision study with DNV-GL and Hamburg University where numerical studies have been completed on model tests with full-scale containment system and bulbous bow collision apparatus. No loss of a containment system has been reported, even with a very high collision energy of approximately 1250 MJ. This energy is equivalent to a T-Bone collision of a vessel of 100 000 t at 9.8 knots. Overall, a full array of LNG fuelling and handling solutions have been consolidated from the latest improvements, updated LNG knowledge and newly-established industrial partnerships, including all types of engines and the definition of operational profiles. If the main engines are of 2-stroke high pressure type (around 300 barg), they would be fed using a high-pressure pump and a high-pressure vaporiser. The correct level of redundancy should be incorporated therein considering minimum availability. The main questions relate to the boil-off rate. The answer to what the boil-off rate is depends on the power balance in order to determine any potential excess of gas (power consumption of auxiliary engines less boil-off rate equivalent) during all phases, including voyage, idling, port stay, loading and maneouvering. The excess gas quantity will dictate the best solution, whether it be a small quantity where gas could be simply stored in tank, generating little pressure increase; intermediary quantities where simple operational procedures are to be implemented in combination with using installed equipment; or larger quantities where dedicated equipment is installed. One dedicated equipment could be a marine proof LNG recondensor or a high-pressure compressor to interconnect low and high pressure systems. It could also be considered using the generally-existing dual fuel boiler in excess gas recondensation mode, which appears possible if such equipment meets requirements for boil-off gas (BOG) treatment status. If the main engines are of 2-stroke low pressure type (approximately 20 barg), the same design principle applies, with the possibility to combine both networks using a dedicated compressor which is flexible enough to feed any of the two networks: main and auxiliary engines. If the main engines are of 4-stroke low pressure type (6 – 8 barg as per auxiliary engines) or ‘gas only type’, then the scenario falls into a LNG carrier case where either a parallel or a typical arrangement could apply. The redundancy level is updated accordingly. If the main engines are of gas turbine type, the pressure level of equipment has to be raised accordingly (around 30 barg). If the main engines are of ‘free flow type’, the inlet turbocharger will generate the requested engine pressure, implying that atmospheric pressure at gas valve unit inlet is sufficient. The compressors could then be skipped, provided auxiliary engines to be of ‘free flow type’ as well. By working with equipment suppliers has allowed GTT has been able to define an optimal solution per engine and operational profile type. Other notions have been incorporated, such as the availability of systems and sub-systems, failure rates, maintainability, lifecycle cost analysis, footprint and weight considerations. Indeed, one of the advantages related to the membrane type containment system is its volumetric efficiency. A better volume usage rate and lower overall weight permits the loading of more cargo in the vessel. It is crucial to balance the induced advantages and drawbacks through specific OPEX, CAPEX and MAINTEX points of view, which GTT and partners have incorporated in design tools. This optimisation journey will progress as the performance of equipment and operational profiles evolve, as well as feedback from operation. Image: © ENGIE_BESTIMAGE - WERDEFROY YANN.